The actress was tapped to introduce the boys of One Direction prior to their performance the American Music Awards on Sunday, Nov. 24. The American Horror Story: Coven scene stealer was so excited to meet the boy band, however, that she stopped two of them on the red carpet and asked to take a few selfies. The TV star looked radiant in a Lanvin dress, which she paired with a Rodo clutch and Casadei pumps. "I've been eyeing them for about 20 minutes," she told Jenna Ushkowitz and Zendaya on the red carpet. "I'm so excited to see them. I think they're so talented." After snapping a snapshot with Liam Payne, Roberts uploaded the picture to Instagram and wrote, "#OneDirection you made my night!!!! 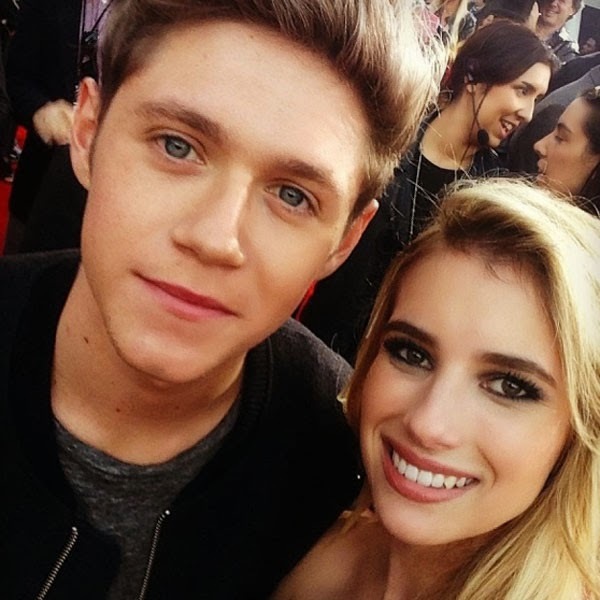 Roberts also took a photo with Niall Horan and added the caption "#omg." The 22-year-old actress got the chance to meet the rest of the group—including Zayn Malik, Harry Styles and Louis Tomlinson—after they performed their latest single, "Story of My Life." Roberts called the experience "a dream come true." During the show, Roberts also met another pop music icon: Lady Gaga! The picture was, of course, shared via the actress' Instagram account. "Love," she wrote in the caption. While Mother Monster wasn't nominated that night, she did take the stage with R. Kelly for a sexually charged performance of their hit song, "Do What U Want."